Fickle Feline: Keep Your Friends Close and Your Stapler Closer. I probably shouldn’t admit this in such a public forum, but I have a thing for office supplies. Meaning, I fancy really nice, top notch pens, rulers, paper, notepads, mechanical pencils, paper clips, scissors and staplers. If my work doesn’t happen to supply my preferred brand of a specific office product, I will bring my own from home. Yes, I’m that particular, specifically about my stapler. But my stapler - it isn’t just any stapler. It has a special history. 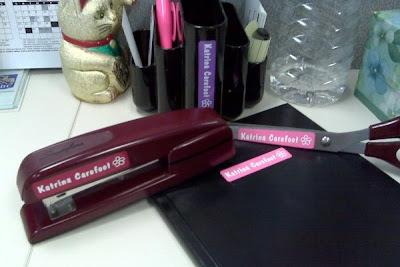 It is a burgundy, Swingline stapler. And how do I say this nicely? No, you CANNOT borrow my stapler. Yes...LOVE that movie. That was the inspiration behind my stapler fetish. I too have a love of good stationary - in fact one of my favourite Christmas presents ever was from my (soon to be) in-laws the first time they met me. They made up a bag of all kinds of things to use in the classroom -rainbow coloured paperclips, a stapler and multicoloured staples, push pins, pencil crayons, a battery operated pencil sharpener, bulldog clips and one of the best pen and pencil sets I have ever owned. They couldn't have done better! Since then, as a teacher I steal pencils from kids all the time - one yellow school pencil with a slightly chewed eraser on the end is very much like another. That's a problem in a Grade 1 class where the pencils are carefully counted out, one per student at a table. Along comes Ms Smith to help you with your math problem and as she wanders away you have another - no pencil to write down the answer! So much so, I actually have one of those yellow pencils with masking tape around the top proudly proclaiming 'Ms Smith's pencil'. The kids love returning it to me or pointing out that the pencil I'm holding is not mine... I might have to invest in my own Mabel's Labels!!! Thanks for the post Kat! I haven't read the rest of this post yet, but wanted to say I label ALL my office goods as well. I work from a home office now, but all my old stuff has TINA written on it. I almost quit a job over a chair dispute once. My husband thinks it is funny. Those office beotches are big fat thieves ! Pretty much everything I own has labels..lol I get a little ocd about it ! I got labels from Mabel specifically for my stuff at work. I swear some of that stuff has legs it goes walking so much...but not so much now that I've got my name plastered all over it!